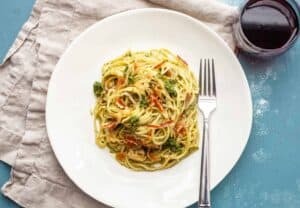 This pasta mashup has my favorite two pasta sauces mixed together: Fresh pesto and silky smooth carbonara! The trick is to stir the pesto into the carbonara sauce before adding it to the spaghetti. And don’t skimp on the crispy pancetta bits! 1) To make pesto, add basil leaves, ½ cup parmesan cheese, pine nuts, olive oil, black pepper, and salt to a food processor. Process until the mixture is in a paste, scraping down the sides a few times to make sure it’s evenly processed. 2) Make the carbonara sauce by whisking together 2 whole eggs, 2 egg yolks, ½ cup Parmesan cheese, and 1/3 cup of the finished fresh pesto. Set aside. 3) Add pancetta to a large skillet over medium low heat. Cook pancetta slowly to render out fat until it gets very crispy, probably about 10 minutes of cooking. Remove pancetta from skillet. 4) When pancetta is near done, drop your spaghetti into salted boiling water. Cook according to package until spaghetti is al dente. Be careful not to overcook the pasta as it will continue to cook a bit in the sauce. 5) Add 1/3 cup of fresh pesto to the skillet with the rendered fat from the pancetta. Cook for 2-3 minutes, stirring constantly. Pesto shouldn’t brown at all but should become very fragrant. Add half of the crispy pancetta back to the skillet. 6) When spaghetti is al dente use tongs to transfer it straight from the pasta water to the skillet. Don’t drain the pasta in a colander. Using tongs, stir the pasta into the pesto mixture. 7) Add ½ cup of hot pasta water to the skillet and remove skillet from heat. Then pour in carbonara sauce and toss vigorously with tongs. Continue to toss spaghetti with the carbonara sauce for a minute or two. If the sauce appears dry at all, add more hot pasta water by the ¼ cup. Serve pesto carbonara immediately garnished with extra pesto dollops (you should have some leftover) and topped with the reserved crispy pancetta. This delicious recipe was brought to you by Macheesmo. Read the full post at https://wp.me/pkSYO-gGp.